End capl for 1 1/2 inch diameter indoor or outdoor curtain rod. Available in two colors in stock, ready to ship. It can be used indoor or outdoor. Use on those windows that face patio or pool area, or use inside on any window. Charleston collection by Design Elements. 3 inch projection wall mount bracket for 1 1/2 inch diameter indoor or outdoor curtain rod. Includes hidden lock screw to hold rod. Use with C-Rings pass draperies by the support bracket. to Available in two colors in stock, ready to ship. It can be used indoor or outdoor. Use on those windows that face patio or pool area, or use inside on any window. Charleston collection by Design Elements. Zinc plated. Slide for 94003 , 94004 and 94008 drapery track. Right hand for Ripplefold draperies. Baton wand can be attached to open and close your drape. Brass finished cup hooks, 7/8" Projection (Boxed) Minimum 100 each. Drapery rods rings. A commitment to quality. Our commitment to quality is steeped in tradition. Whether it's inspiration you seek or innovation you crave, energize your creative spirit with the drapery hardware collection by Graber. 7 rings per envelope. White shown. Four finishes, bright brass, antique brass, black and brushed nickel. Adjusts from 48 inches to 84 inches in width. Projects 3 1/2 to 4 1/2 inches, clearance 2 1/2 to 3 1/2 inches. 1 1/2 inch diameter Windsor curtain rod. drapery hardware collection by Graber. Rods are metal, slides and finials are plastic, includes mounting hardware. Select color from drop down box. 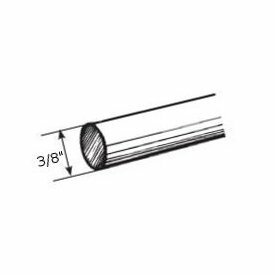 1-541: Decorative traverse rod set 28-48" two-way draw projects 3 1/2 to 4 1/2"
Custom sized to your specifications. Includes assembled rod, wall or ceiling brackets and baton. 94003 track, 20' maximum track set length, one way, 40' maximum track length two way draw. Maximum weight one way draw 40 pounds, two way draw 80 pounds. Can be used for hospital curtains track with ripplefold or pinch pleat draperies. Architrac baton draw drapery track by Kirsch. 3 feet minimum included in base price. Plus truck freight over 104".